There is a new Wi Fi module around. It supports UART, I2C, SPI, and Ethernet interfaces. The board has a RT3050 320Mhz CPU with 8MB of flash memory and a 32MB onboard RAM chip. 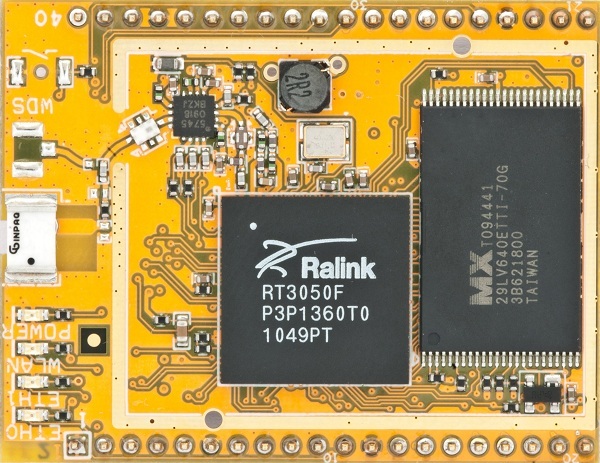 It is built to support Linux based embedded systems via the OpenWRT. This entry was posted on Saturday, October 29th, 2011 at 12:00 pm	and is filed under wireless. You can follow any responses to this entry through the RSS 2.0 feed. You can skip to the end and leave a response. Pinging is currently not allowed. Awesome, I want one, how much does it cost? The first wifi module that comes close to the Ministation from Ubiquiti. nice project name! and nice project too! i’d like to see more about serial interfaces, i2c, spi, i2c, ecc ecc. i think they’re the main reason to choose boards like this, for the sake of facts i bought a tp-link cheap and small wifi router (TL-WR703N) for 15 bucks (shipping included), can run openwrt, usb port, and so on, a small cheap fun device, but it has no accessible serial ports, so this one would be a nice alternative. Where did you get your TL-WR703N @ $15, including shipping? This thing has only one Ethernet port? What’s up with that? Nope I think I’m wrong. There are LEDs for Eth0 and Eth1. It has 2x ETH 100Mbit ports. One of them is passive POE enabled. So this thing is called “Carambola”. FYI, in Indonesian, “Blimbing” is the name for Carambola.